Last Sunday was a picture perfect day of "car life". 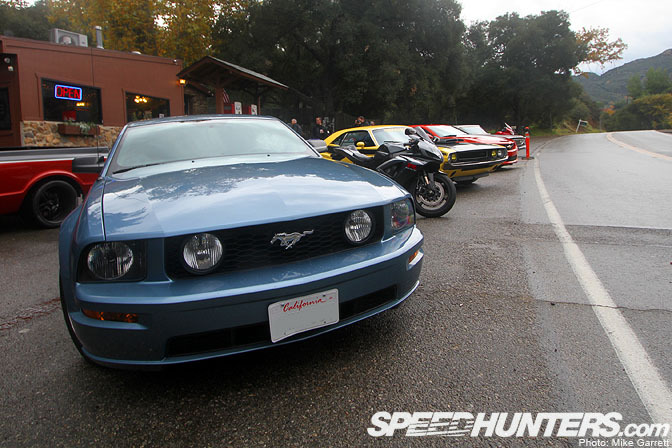 It started off early in the morning when the wife and I hopped in my Mustang and drove up to Woodland Hills for the Motor 4 Toys charity meet. 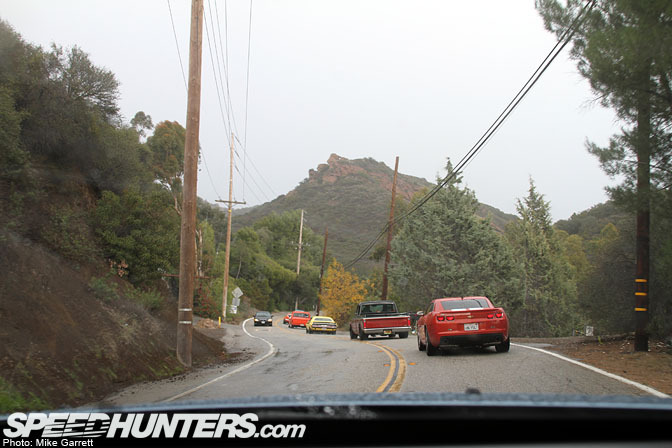 After hanging around for a few hours, snapping photos and drooling over the machinery, it was time for the day's main event begin – a cruise through the mountains of Malibu with a group of enthusiasts from Hotchkis Performance. The Hotchkis "H-Team" is trying to change the perception of muscle car people. 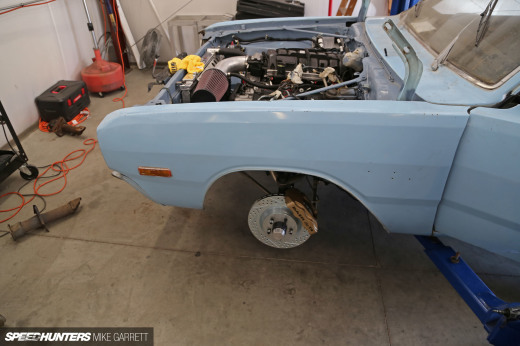 The H-Team wants muscle car drivers to get and out and drive their machines. Sitting around at a car show and then going home just doesn't cut it. 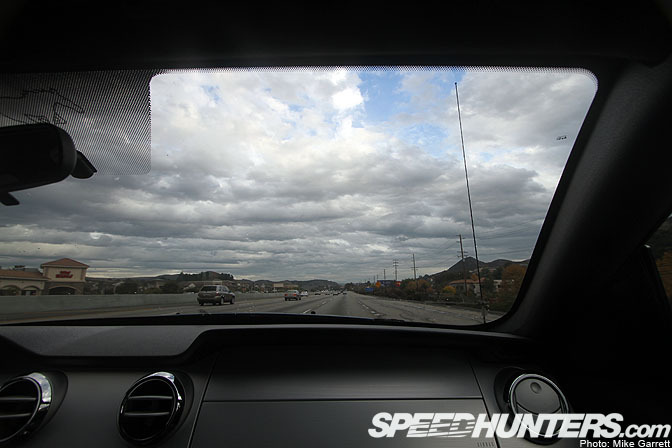 At about 11am, it was time for the group to head out for an adventure in the hills of Southern California. Slowly, the cars rolled out of the Warner Center and onto the street. I hung around the back of the pack, feeling slightly embarrassed to have my mostly stock Mustang tagging along with this crowd. The first stretch of the route took us a few miles north on the 101 Freeway. 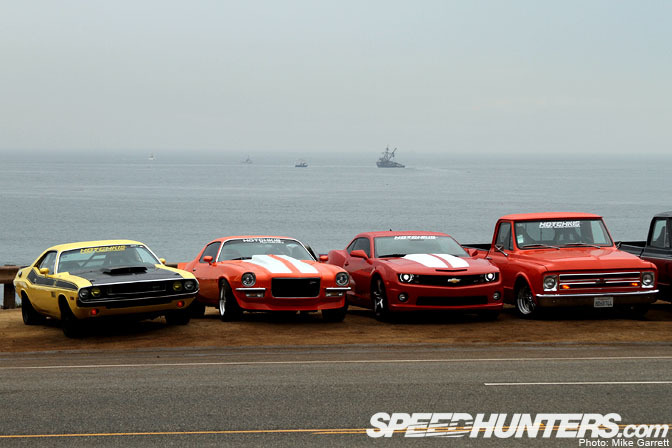 The line of classic and modern muscle cars (and pickups!) looked great as they rolled through the freeway traffic. A short time later, it was off the freeway and onto some more engaging roadway. Nobody was out to prove anything. It would be a relaxing drive through great scenery with a great group of people. The Hotchkis E-Max Challenger looks absolutely awesome going down the road, with its fat rubber filling out the muscular profile. I was offered the keys to this car several times, but decided to save my joy ride for the next Hotchkis track day at Willow Springs. Here's the group cresting the hill on Kanan Road. No problems here! 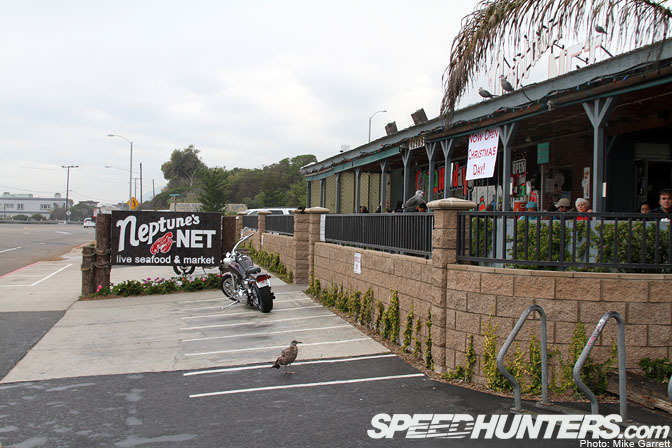 Eventually, we made our way down to Pacific Coast Highway and the group stopped for lunch at the famous Neptune's Net Seafood Restaurant. 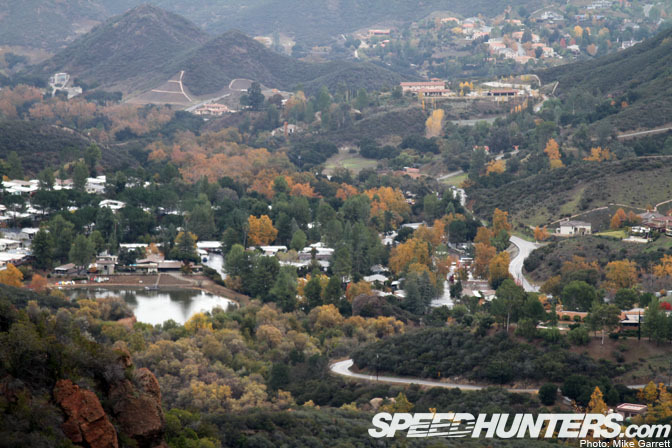 Perhaps you recognize this place from a certain film starring Paul Walker and Vin Diesel? 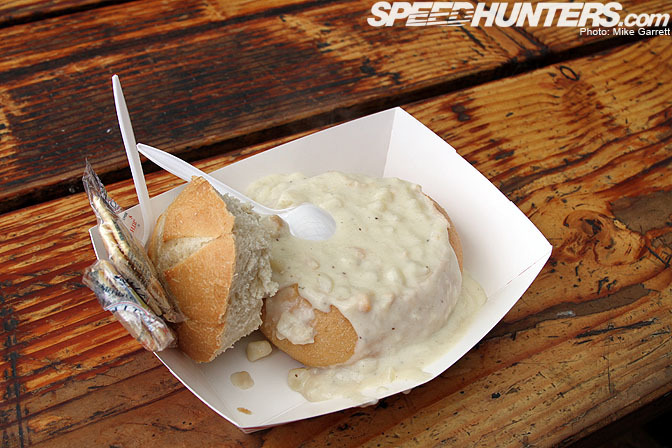 Linhbergh spent all of lunch reciting lines from that fantastic film, and enjoying some Neptune's specialties like clam chowder in a bread bowl. Perfect for a cold, rainy day. Even though it wasn't one of the beautiful Southern California days, there still plenty of surfers out riding those famous Malibu swells. Surfers come for the waves, car guys come for the roads. Even with the crappy weather, there were some seriously cool cars cruising around the area. 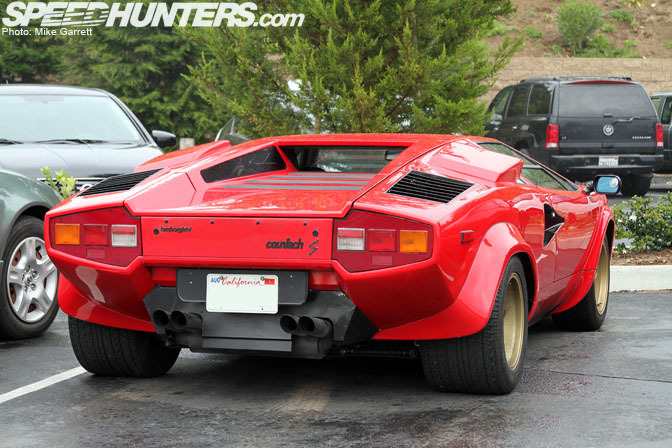 After lunch, we spent a great while admiring this majorly awesome Countach that was sitting in the Neptune's Net parking lot. They don't call them "dream cars" for nothing. By now a steady rain had begun to fall, but that didn't stop the group from taking photos with the mighty Pacific as a backdrop. Are you legit? 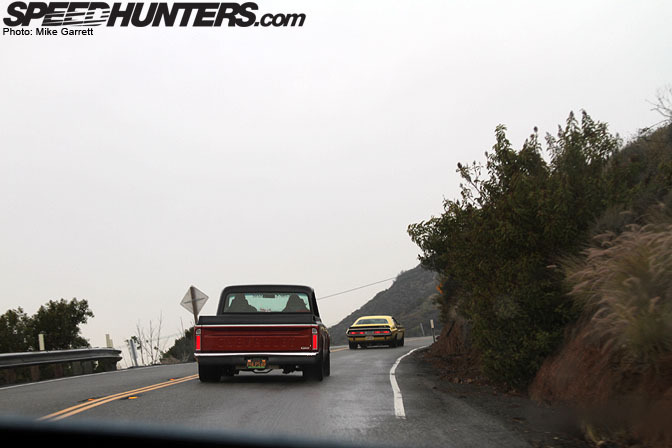 If you take our you hopped up Chevy C-10 out for a canyon drive in the rain, then the answer is yes. 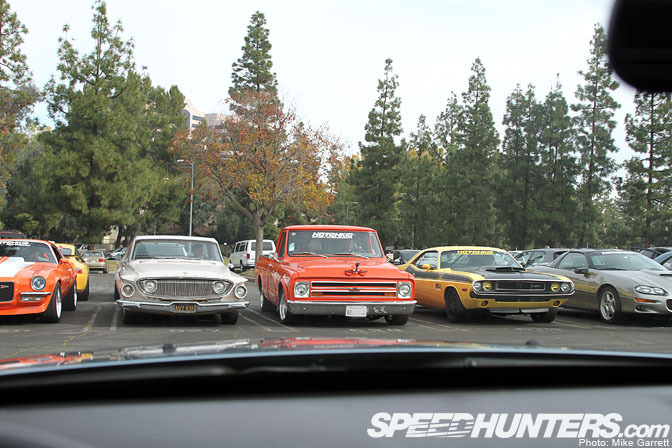 Finally, the group of V8's, and one slant six fired up. A left turn on PCH, and the the drive continued. A couple miles later, it was off of PCH and on to the tight, winding Decker Road. Things are about to get fun. 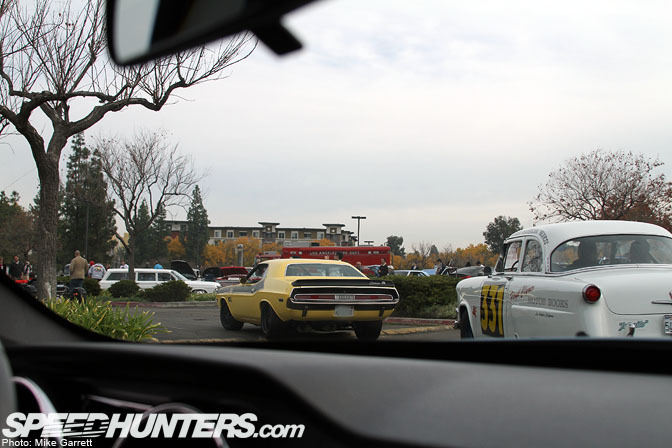 You probably remember Rob' s C10 pckup from Linhbergh's recent feature. 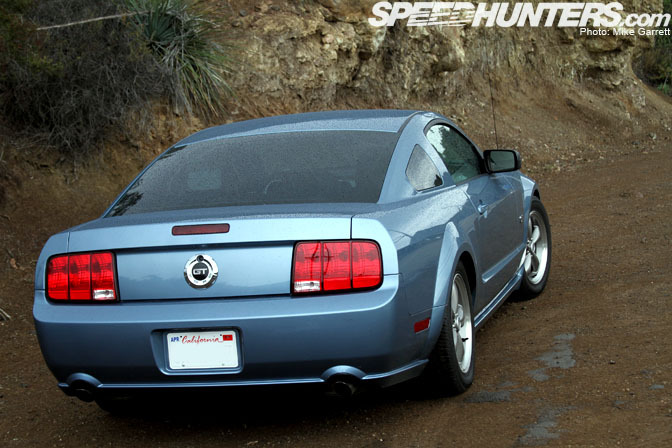 This was my first time taking a real drive in my Mustang since I installed the new shocks and springs, and although the roads were wet and nobody was driving particularity hard, the car felt pretty good. 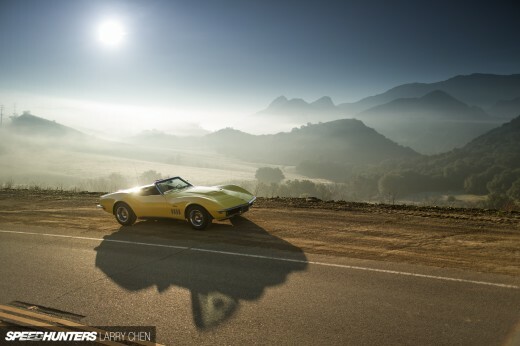 That's John Hotchkis up there in the 5th gen Camaro, one of the company's latest project cars. 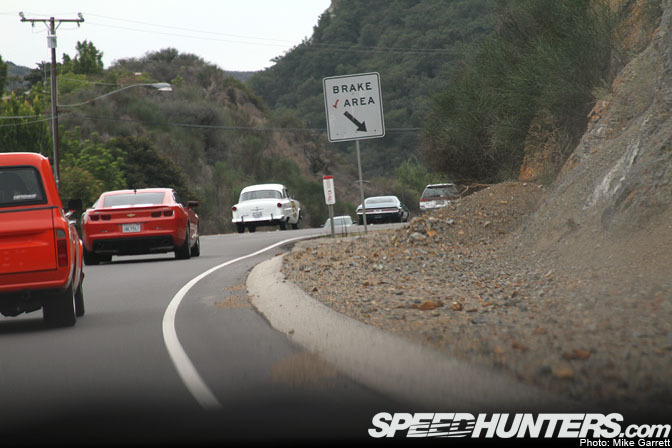 After hopping on to the famous Mullholland Highway, the group stopped for another leg stretch and photo session. That black Yaris up there belongs to Cory from Kahn Media, and yes the little Toyota was actually the one leading the pack. 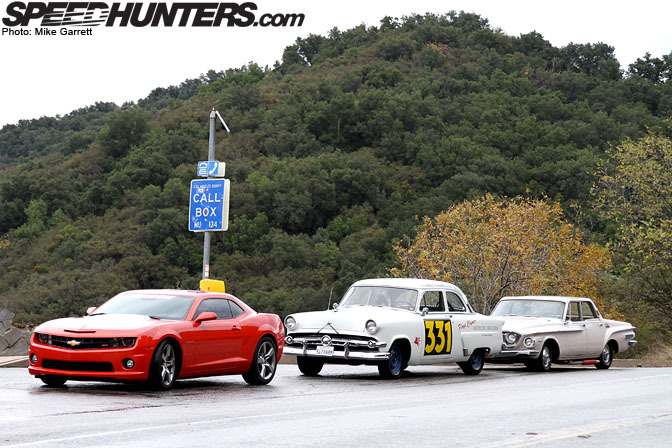 It's not all too often you'll see a 2010 Camaro, a Carrera Panamericana Ford, and a slant six Dodge in one group. While we were stopped, we had a chance to take in some of the amazing scenery. At times, it didn't even look like Southern California. GM, Ford, Mopar. Everyone gets along. 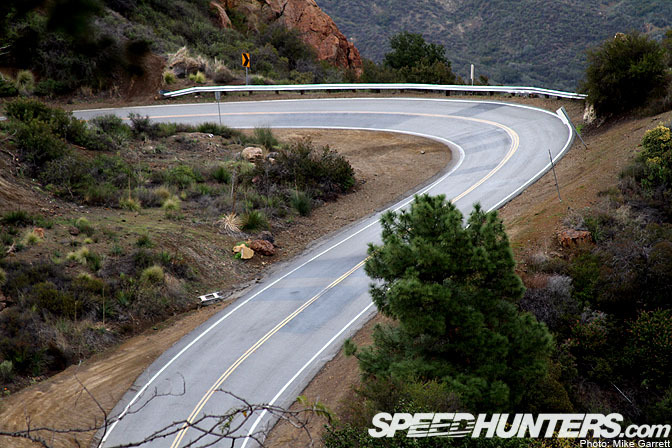 Some people might come up here for the scenery, but motorcycle riders and car freaks like us come for the corners. Here's the famous "Snake". 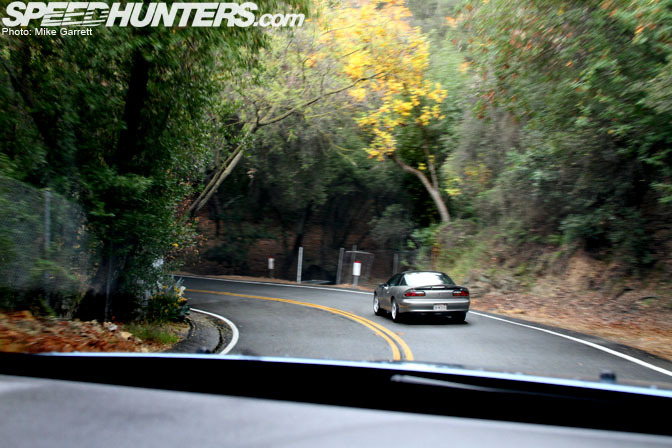 Coming downhill along Mullholland. 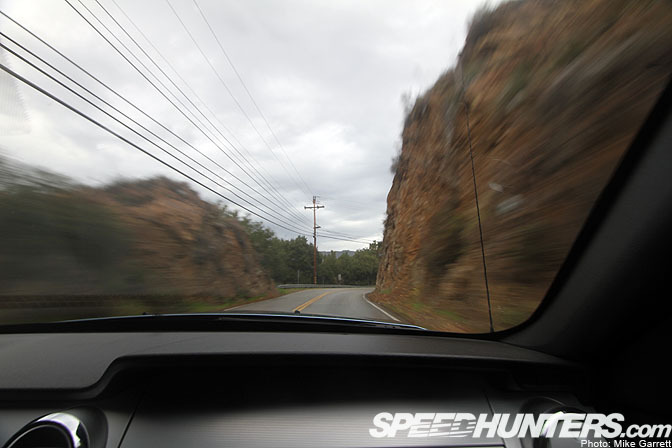 Even at a "relaxed" pace, the road is an absolute blast to drive. 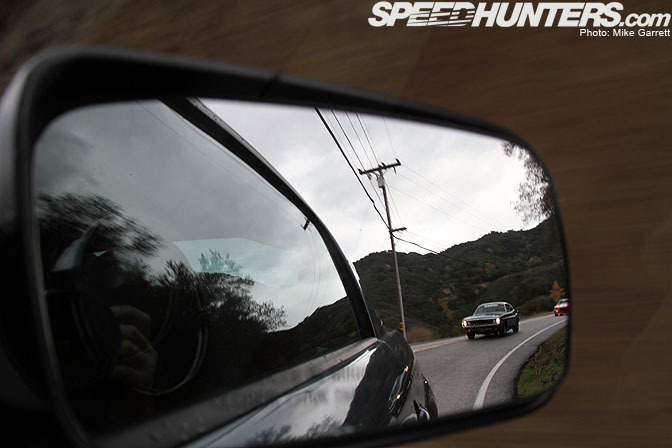 That Challenger behind me belongs to Elana from Kahn media. 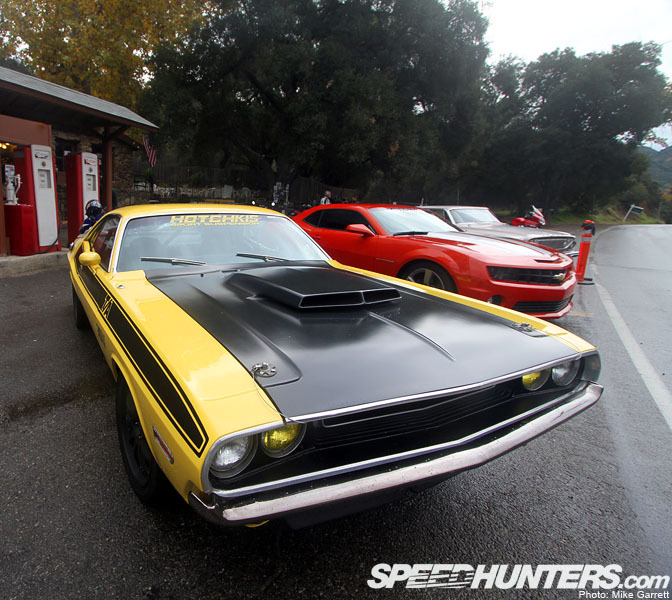 She's a Mopar freak and the Hotchkis-equipped Challenger is her daily driver. After coming down Mullholland, our final stop of the day was at the famous Rock Store. That orange Camaro there is the original Hotchkis F-71 project car, now owned by Robert who came all the way from Arizona to take part in the drive. The Rock Store is a world famous motorcycle and car hangout, and even though it was raining, there was plenty of activity. You can feel the history inside the place. 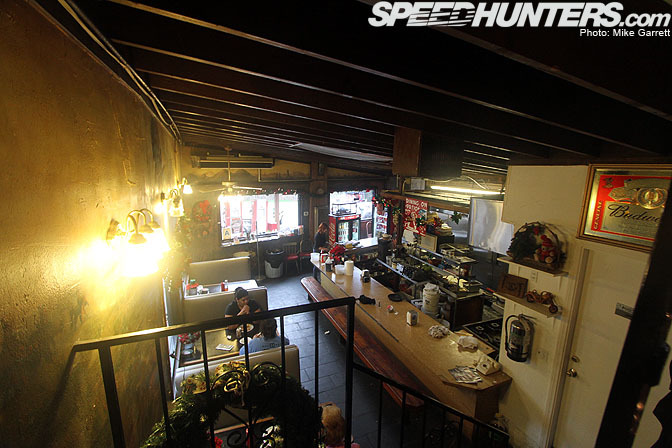 I suppose it's SoCal's version of the Ace Cafe in London. One more shot of the E-Max outside the Rock Store, because I can't resist. After hanging around for a bit, it was time for everyone to go their separate ways. 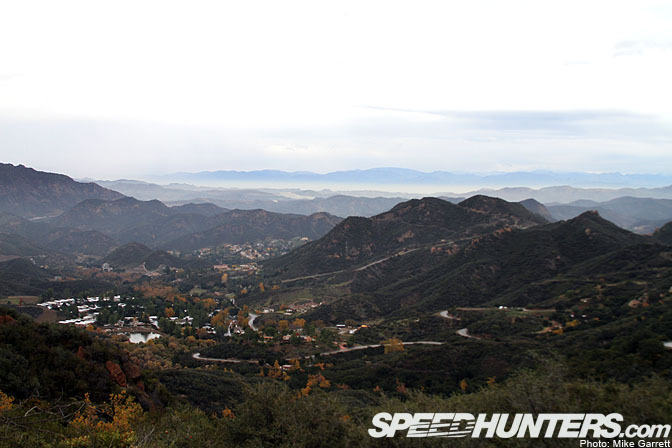 I enjoyed the last few miles of winding canyon road on my way back to the freeway. I'd like to thank Hotchkis and Kahn Media for inviting me to tag along. The clouds and rain didn't stop anyone from having a good time, and I'm pumped for the next run. Great to see that you guys went through my home town area (Agoura Hills). I remember spending countless hours driving through those canyons with my friends. Glad that you had a chance to share the beauty that I have been enjoying for all these years. I spy a lonely looking red S13 is on these shots... lol. That Hotchkis Camaro and the Countach made my pants explode. Dream car in the right colour too!!! And built by the right people, just need to change the rims. 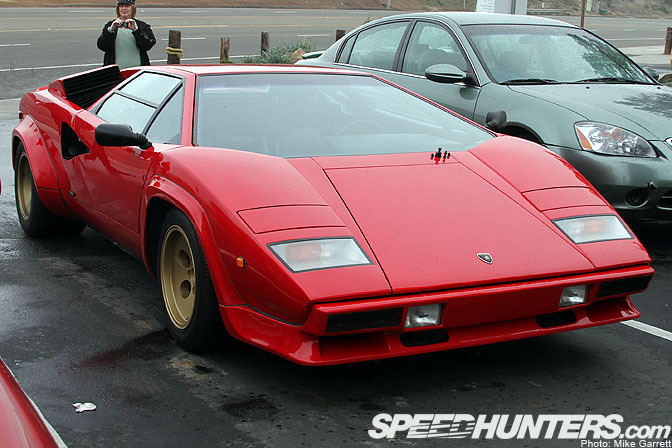 Best post on speedhunters ever!!! I wish there was sound with the pics..
Man I wish things like that happened up here in BC. I like the s13 "photo-bomber" in the picture where you talk about the Yaris. I went on the almost the same run with MOALA (Mini Owners of America Los Angeles). Very fun run with 2nd and 3rd gear corners thru the twisties. Those Classic Minis were so quick that they left me while I was driving my ED9 CRX. Muscle cars running through there looks pretty cool. Nice drive with some nice rides...should've drove it more when I lived up in the area (facepalm), though I did ride with a friend in his EVO once. 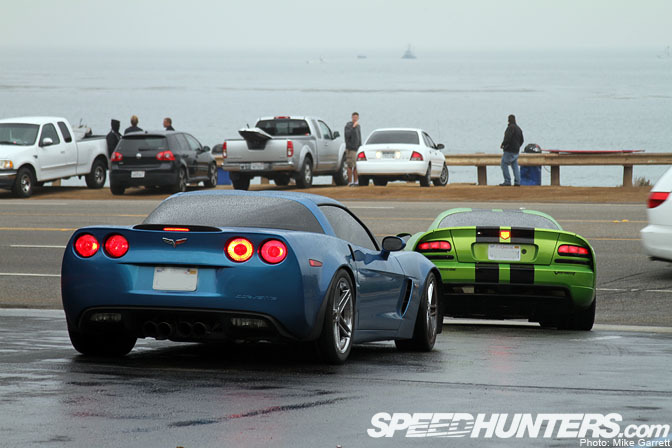 Very awesome cars and very nice photos. It looked like a lot of fun. I guess i'm so desensitized to American muscle that I actually noticed the red S13 hatch in the background of the Yaris picture. Anyways, drive + meal looked hella fun. 1st shot of Chally to desktop pleasee! !